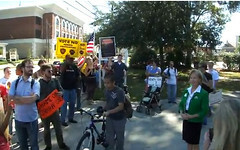 For the second week in a row, protesters picket outside the Chamber of Commerce to the tune of: 'No Consolidation'. But what does Valdosta's first black mayor say about it? "Just Vote No," the Mayor chants from a podium. Mayor Sonny Vickers is one of the strongest opponents of the consolidation plan. "The group that's pushing this has no authority. No kind of plan to tell us anything. Because they are not on the board. So they cannot tell us anything specific about what's going to happen," says Mayor Vickers. A familiar scene from the Big Apple reaches Southern Georgia. 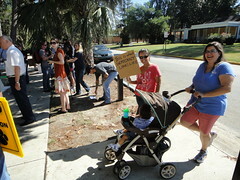 It's called "Occupy Valdosta." 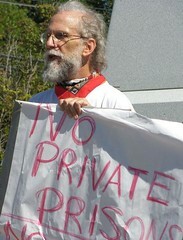 More than 100 protesters take to the streets to fight corporate greed and social injustice. There the crowd cried two familiar words: 'No Consolidation'. "My children go to city schools. I live in the county. I can't vote. That's not right," said Susan Smith. Make your taxes go up, and you'll end up paying more taxes. This is just one way that people making minimum wage are going to lose their home. Don't be fooled! If you're a voting resident of Valdosta, vote no on November the eighth on school unification. Thank you. Just as we were leaving the Chamber of Commerce, they even called back with the permit for today's event, 11AM this morning at MLK Memorial Park. 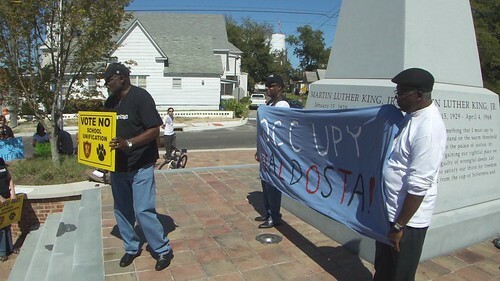 The occupy wall street movement that's spreading around the country arrived in south Georgia. That's her with the big camera in front of the palm tree, come to see what democracy looks like. 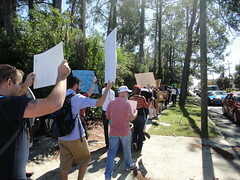 They're protesting issues from corporate greed to unemployment all the way down to local issues including school consolidation. How's this for an ad linked to Martin Luther King Jr.?